Co-op were on a mission to find the most creative young people in the UK to design new labels for their egg boxes. We had over 4,000 entries from across the UK and judging was tough. 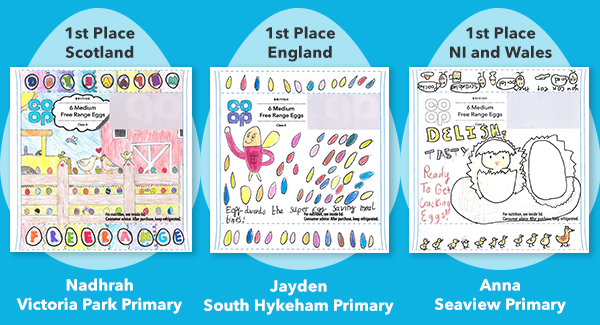 A very big congratulations to our three winners who have won £1,000 worth of art equipment vouchers for their school and will be seeing their designs on packs of eggs in Co-op stores early next year. Winning £500 worth of art equipment for their schools are Emily Garden (Ysgol Llanfawr), Lois Mackay (Viewlands Primary School) & Evelyn So (Kirkham Grammar Junior School). A big thank you to everyone that entered, we saw some absolutely amazing entries!